Updated Sunday August 13, 2017 by Ben Leeson (Sudbury Star). Experience served Cloe Douillette well at the 2017 Canadian Lacrosse Association Female Nationals in Halifax last week. Selected for the second straight year as a goaltender for Team Ontario, the 14-year-old Sudbury Rockhounds standout backstopped the provincial bantam squad to a national title for the second straight year, capping the tournament with a 5-3 win over British Columbia in last Friday's final. "This time, I was more confident in myself," Douillette, a Macdonald-Cartier student, said on Wednesday. 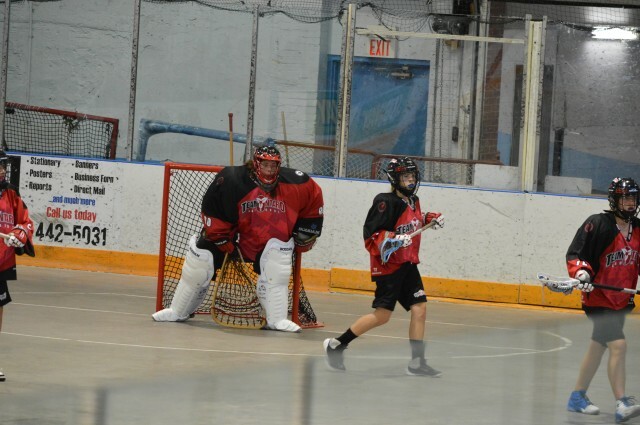 Confidence has been a key part of her development since she first took up box lacrosse at age three. "You can see it in yourself that you've improved, when you're helping out your team and you're making a big change in the game," she said. Douillette helped Ontario to post a round-robin record of 5-1, winning her three starts 4-2 against B.C., 4-2 against Alberta and 7-0 against host Nova Scotia. She also played well in the title game against the British Columbians to win gold and secure a spot on the all-star team with a sparkling tournament-best 1.75 goals-against average. All of that left Douillette feeling good about her potential in the sport. "It made me feel like I could have a future in it," she said. She shares her gold medals with her family, including her father Benoit. "He put me in lacrosse when I was three, turning four," Douillette said. "He took me to every practice with Team Ontario, which were all in Toronto and he has given me a lot of support for those 10 years." Starting out in paperweight a year early, Douillette eventually made a home in the goalie's crease. Now, lacrosse ranks alongside basketball as one of her favourite sports. "I started off as a player and I didn't really like it, because I didn't like running," she said. "Now that I play goalie, I like it more." She enjoys the pressure that comes with playing goal and believes she plays her best in big games. "It's a big responsibility," she said. "I'm good at dealing with stress, so I feel like when I get nervous, I play way better." For full results and stats from the CLA Female Nationals, visit femalenationals.pointstreaksites.com.